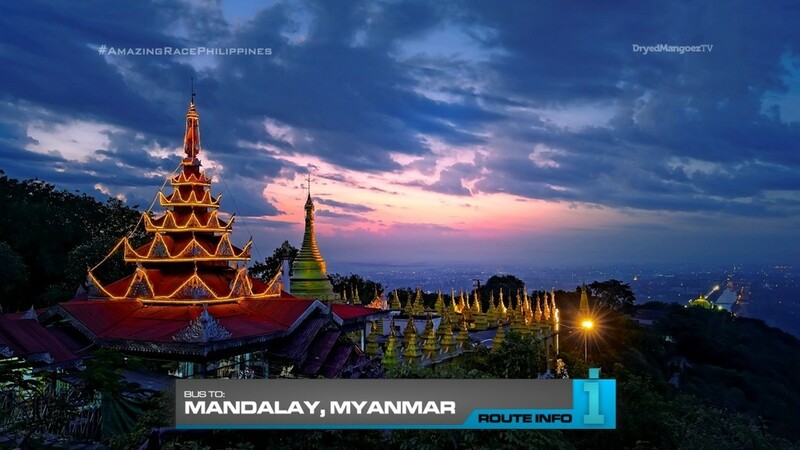 The 10th Leg of the 10th Race starts immediately as teams must now hop on a bus to take them to the historic city of Mandalay, Myanmar. All teams will end up on the same overnight bus that will drop them off the next morning at Chan Mya Shwe Highway Station. 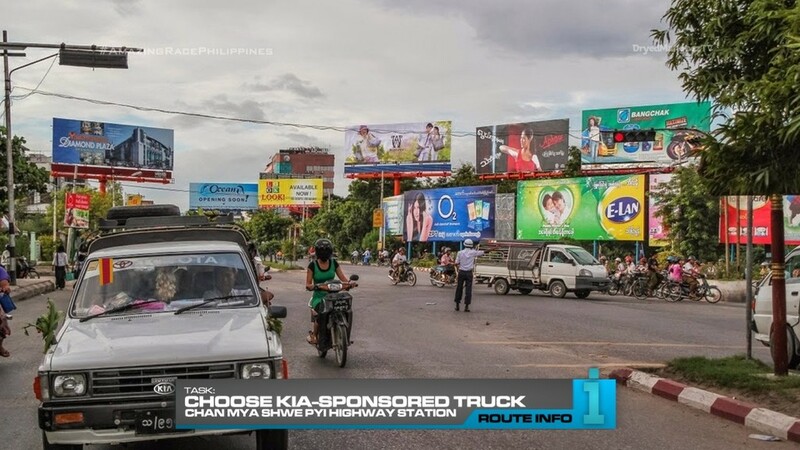 Here, teams will choose a Kia-sponsored local truck and driver. Riding in back, teams will direct their driver to take them to the U Bein Bridge in Amarapura for their next clue. 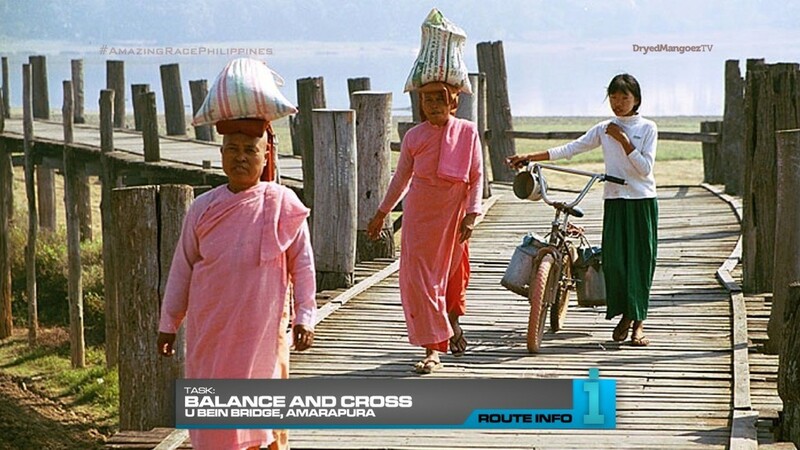 Teams will join young Burmese nuns who balance sacks of food on their heads as they make their way across the U Bein Bridge, the oldest and longest teak bridge in the world. Teams cannot touch their sacks. If they do or if their sack falls off their heads, their accompanying nun will time them for 30 seconds before they can continue. After they’ve delivered the food to the other side of the bridge, team will open the next clue which reveals the Road Block: Who’s feeling festive? 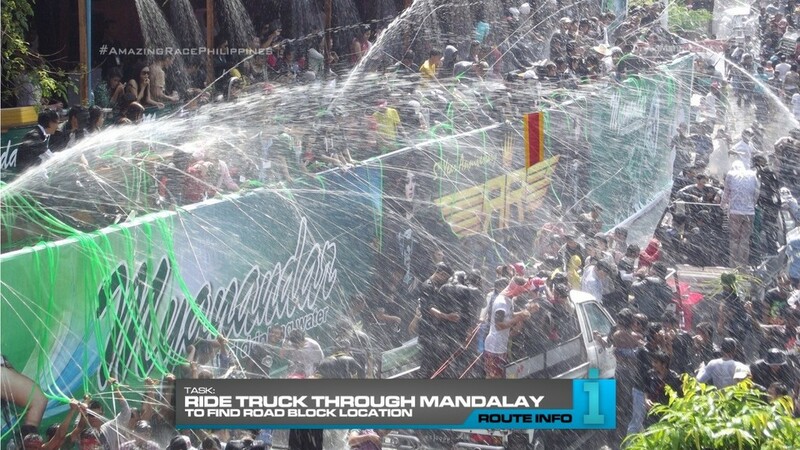 For this Road Block, teams will hop into the back of their trucks and be driven through Mandalay’s main thoroughfare. They must keep an eye out for a Race flag which is where they will be performing the task. At this flagged location in the city center, the Road Block participant will finish assembling a traditional float for the annual Thingyan Festival. What teams may not know is that Thingyan is the Burmese New Year water festival. 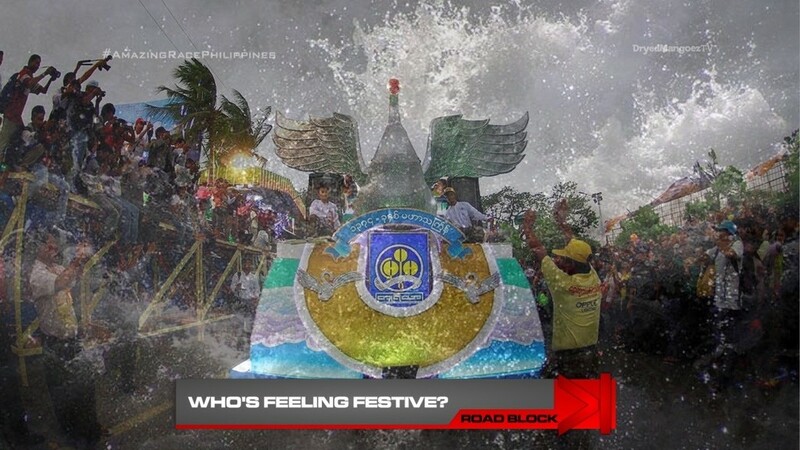 And teams will be doused with water along the road to and at the Road Block location! After the wet Road Block, teams will get the next clue which reveals the Detour: Pack It Tight or Move Them Loose. In Pack It Tight, teams must learn how to make a Burmese broom by hand. Once each team member has made a broom, they must then load a bicycle with four large bundles of brooms and deliver them to a marked stall inside the Zeigyo Market to receive their next clue. 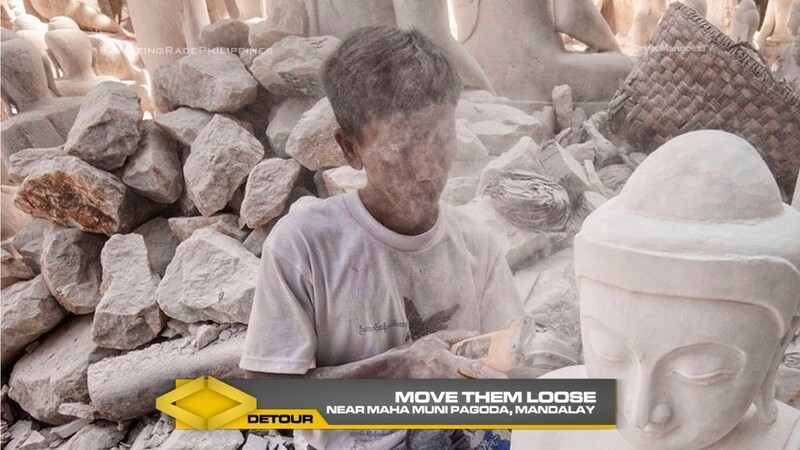 In Move Them Loose, teams must head to Stone Carvers Road near the Maha Muni Pagoda where they will unload 10 large marble blocks from a truck and deliver them to a nearby flagged stone carver. Once the carver approves of their 10 stones, they will receive the next clue. 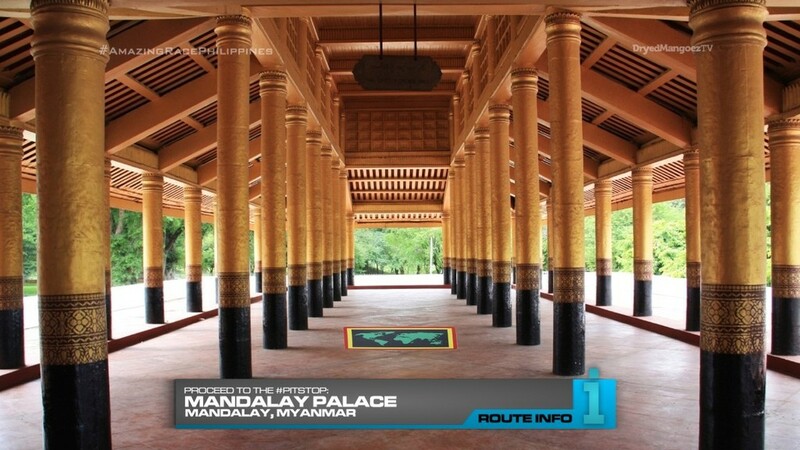 And that clue points teams to Mandalay Palace. And in one of the halls is the Pit Stop for this Leg of the Race. This should hopefully be another good Leg in Myanmar. The Zero-Hour Pit Stop is definitely a logistics decision to get teams into Mandalay by next morning. 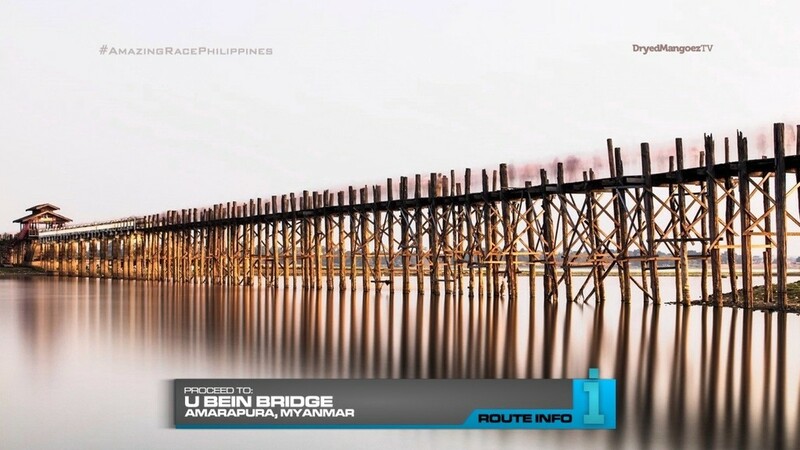 The U Bein Bridge task should be a nice first task of the Leg. It should look great in 4K UHD too, with drone shots, in the early morning hours. The reason for teams riding on the back of the truck is of course for the fun surprise that they will be doused with water by locals celebrating Thingyan. This should hopefully be a highlight. The Road Block itself is simple and straight forward, but spraying water on teams should make the task worthwhile. The Detour is also straightforward, but two physical tasks that TARPH always needs. 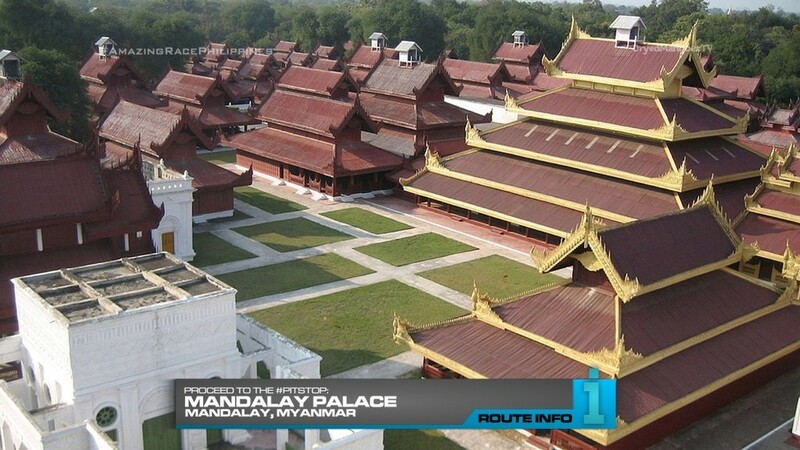 And finally the Pit Stop at Mandalay Palace is a given. So overall, a great Leg!